These days most people have a LinkedIn account. But you know what? It’s hard to know if you look the best you can. You can see the potential – being seen as a professional leader in your industry, attracting relevant people or leads or future employers or media or customers or event organisers seeking a speaker or other players in your work. It feels like the only way to improve your LinkedIn is to spend hours reading blogs and spending time updating your profile. Even then though, will it make a difference? So you update your profile when your role changes, tweak a few things LinkedIn suggests and leave it at that. Have you ever sensed you could get more out of LinkedIn? You get SPAMMED with people to connect that aren’t relevant and you’ve wondered whether it’s worth having a LinkedIn profile. You get very few relevant people viewing your profile, yet industry peers and colleagues have mentioned getting leads and interacting with related people. You’re concerned about how to profile yourself on LinkedIn, who’ll see it. You don’t know what’s important on LinkedIn. The news people post isn’t interesting. LinkedIn wastes your time. You don’t receive any interested or positive comments about your LinkedIn. You’ve heard that being influential and looking good online can progress your career. You can toil at your LinkedIn profile for hours and miss important aspects that can have you standout. How to re-word your tagline, imagery and essential words to attract relevant people are who are searching for someone with your skills and experience. How to use Summary & Experience elements with precision to show professional prowess. 22 professional’s LinkedIn examples will inspire your own. How to create (or update) a LinkedIn profile that suits your personality and expertise so you impress colleagues, industry peers, media, potential employers and others. Be delighted with how impressive you look! How setting up LinkedIn well can save you hours of time through connecting with relevant people – partners, team members and clients – and through expanding your knowledge. How to gain impressive recommendations and endorsements from others so that relevant opportunities come to you, any time of the day or night. How to update the urgent & important sections of your LinkedIn account so you know your profile stands out. Encouragement (it’s important!) and more. 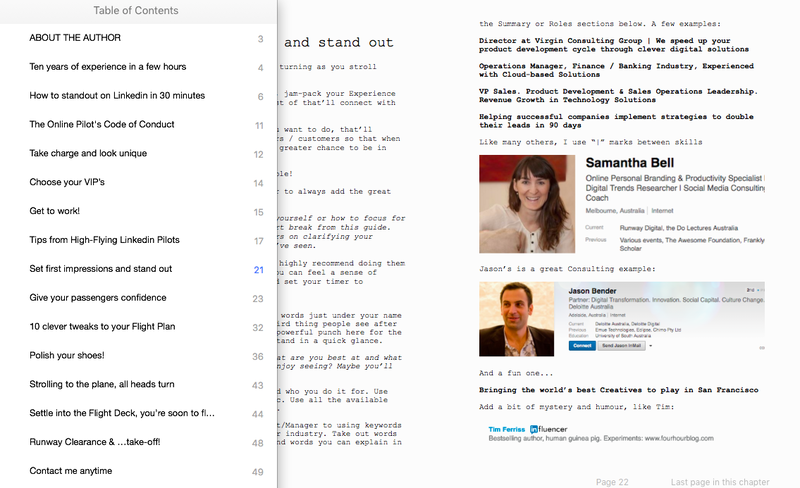 Reading & implementing the Guide will take 30 minutes – 3 hours (you choose). 61 page PDF (also includes ePub & mobi formats). Download the table of contents here. Sam has that uncanny mix of serious business acumen, intense creativity and expert practical knowledge of the digital world. Keep scrolling for more options. Includes a license for up to 10 people and a review of their Linkedin profile. 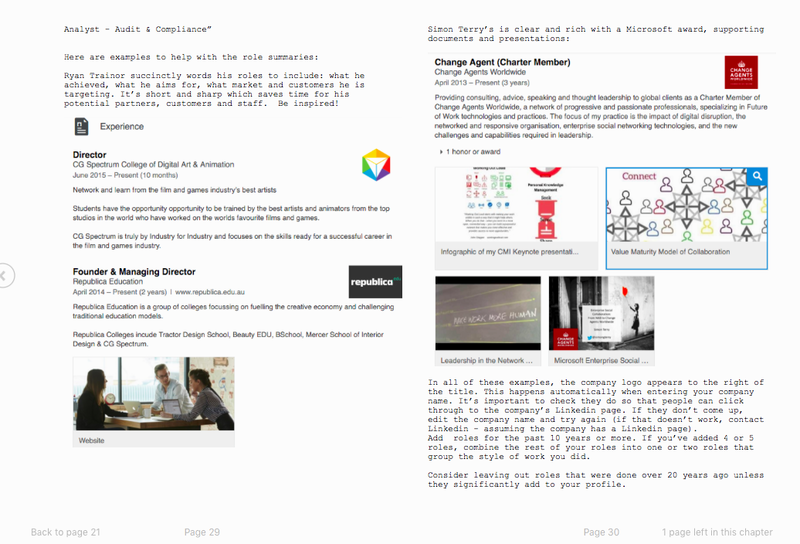 Drop the book on a shared drive/dropbox/whatever and let your team at it. 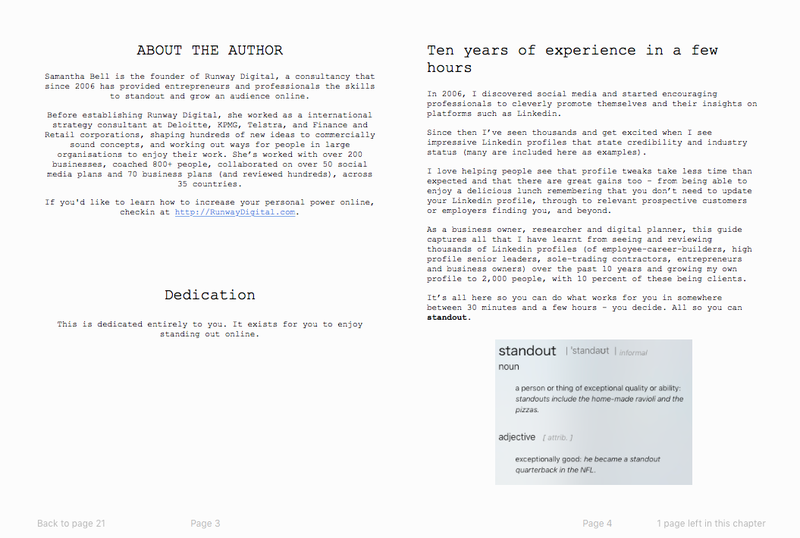 "Sam has now supported Franklyn Scholar on several internal projects. Sam’s unique ability to galvanise our group and get total buy in to projects she leads has been outstanding. Sam was given a tight deadline to assist management in structuring a program to communicate key imperatives to our people recently at our National Conference, the outcome achieved exceeded all expectations and was quantified by 98% of attendees understanding our company direction post the conference. We look forward to an ongoing relationship with Sam and will utilise her services in the future." People with any level of LinkedIn experience. You don’t need to be a LinkedIn expert or even close. If you are a high-profile person, we suggest reviewing plans from this Guide with your PR expert to plan your LinkedIn launch prior to updating (we don’t want your email inbox to explode). If you’re flying high already on LinkedIn with a great profile and are using LinkedIn groups this may not be for you – get in touch to check – as this course will provide tips to grow your audience. This Guide isn’t for people who’s LinkedIn profile is performing as they’d like! This Guide doesn’t (yet) include tips on LinkedIn Premium accounts. But I don’t have a LinkedIn account! Cool. There are tips to setup an account at the start of the Guide. Get ready to save yourself time – go straight to having an amazing LinkedIn profile! Who wrote The Standout Professional’s LinkedIn? This LinkedIn workbook 2017 edition and instructional guide that brings to life the concepts discussed when coaching executives around the world from the UK Film Council to Green School in Bali, to Partners of prestigious, international Consulting houses. 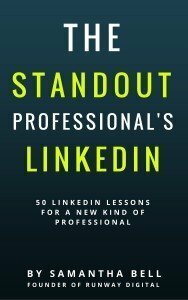 The Standout Professional’s LinkedIn ebook was written by Samantha Bell, who is a digital researcher, a business strategist and the founder of Runway Digital. She has over 3,000 LinkedIn connections, seen thousands of professionals’ LinkedIn profiles, has worked with over 200 businesses, coached 800+ people, tweeted over 20,0000 times, collaborated on over 50 social media plans since 2006 and 70 business plans (and reviewed hundreds), across 35 countries. 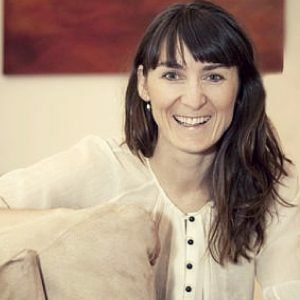 Prior to Runway Digital she worked as a international strategy consultant at Deloitte, KPMG, Telstra, and Finance and Retail corporations, shaping hundreds of new ideas to commercially sound concepts, and working out ways for people in large organisations to enjoy their work. Read more about Sam here. Sam is the most talented and knowledgeable person about Social Media I know. No bragging and fancy words, just simple and awesome advice, tips and ideas.